A young and talented Internet Marketer, Ryan Deiss, created a study in which he proved that a small number of high quality backlinks are better, as produce more traffic, then a couple of hundreds “spamy” backlinks. Even after the Google Panda update, the High Quality Sites seem to be able to rank above everyone else consistently. So our task is to find High Quality Sites. We need first to discover this types of sites in our niche, and then to employ a technique to obtain in bound links from them. I am sure you have Firefox among other browers: Chrome, Explorer, mayby Safari. When you are done you have to close Firefox and re-launch. At this point if we type something like "Affiliate marketing" in Google search box ot whatever keywords you need, and you obtain the screen you see in the next module. You notice a line with new information after each line of Google search and an extra line in top. If we want to sort the Google sites we must click on the down little arrow in top whare I manually put a red arrow. So this is how Firefox and the plug-in are working together to give us sites we need. To make our search 100% usefull, instean to have a keyword search, like the one I use to show you how Figefox is working with Seo Quake plug in, Ryan Deiss come up with a more sofisticated way of serching and he names his teqnique "Authority Codes". site:.com inurl:blog "post a comment" -"comments closed" -"you must be logged in" "ADD YOUR KEYWORD"
site:.org inurl:blog "post a comment" -"comments closed" -"you must be logged in" "ADD YOUR KEYWORD"
site:.edu inurl:blog "post a comment" -"comments closed" -"you must be logged in" "ADD YOUR KEYWORD"
site:.gov inurl:blog "post a comment" -"comments closed" -"you must be logged in" "ADD YOUR KEYWORD"
site:.com "powered by expressionengine" "ADD YOUR KEYWORD"
site:.org "powered by expressionengine" "ADD YOUR KEYWORD"
site:.edu "powered by expressionengine" "ADD YOUR KEYWORD"
site:.gov "powered by expressionengine" "ADD YOUR KEYWORD"
site:.com “Powered by BlogEngine.NET”site:.com inurl:blog "post a comment" -"comments closed" -"you must be logged in" "ADD YOUR KEYWORD"
site:.org “Powered by BlogEngine.NET”site:.org inurl:blog "post a comment" -"comments closed" -"you must be logged in" "ADD YOUR KEYWORD"
site:.edu “Powered by BlogEngine.NET”site:.edu inurl:blog "post a comment" -"comments closed" -"you must be logged in" "ADD YOUR KEYWORD"
site:.gov “Powered by BlogEngine.NET”site:.gov inurl:blog "post a comment" -"comments closed" -"you must be logged in" "ADD YOUR KEYWORD"
site:.com inurl:blog "post a comment" -"comments closed" -"you must be logged in" "SEO"
So, I search ".com" sites for the key SEO. In the next big picture you have the result of Google search, I already click to sort in and the SEO Quake line in top. When you will try this technique, please roll your cursor over each bucket from the SEO Quake line to see all the meanings of the info you get with this great plug-in. You have enough info to start practice. In search result look on pages 1 - 3, not just first screen (page 1). If the search comes out with zero URLs, then broader your key word long tail. 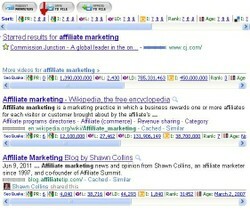 Ex: instead of "affiliate marketing programs", search only for "affiliate marketing". If you do a little searching, you should easily be able to locate relevant sites and start commenting on them, but with value not just spamy comments like "Thanks", "Great", "You rock". After you comment on a side, do a ping of the article you commented on using: pingler.com or pingoat.net , this is how Google will find your URL. In a comment usually you have to fill in: name, email and site URL. I suggest try to add 8 - 14 backlinks coming to your site and this is enough to make a difference. Do you think that the info from the post is useful? Junkoust cleaner probably the most popular cleaner. Junkoust is the brand new revolutionary software tool that lets you cleanup your PC. Download <a href="http://junkoust.com/">Junkoust</a> for Windows from <a href="http://junkoust.com/">http://junkoust.com/</a>. It will clean and fix registry errors, Junkoust removes all junks and unnecessary files like temporary files prefetch files, etc. Thanks for posting! This will be very useful! Thanks for the tip. Again, nice entry though. Very useful. Anyone who is looking for this topic will be glad.